I Learned to Laugh At Myself! Say Goodbye to My Pinstriped Suit, My Designer Tie, My Italian Shoes, My Career and My Dignity and Hello to the Funny Side! Eight months ago I lost my job as a financial executive, and it has been a difficult time for me and my family, as it has been - and is - for millions of Americans. For many months I felt overwhelmed and uncertain about what to do. Then six weeks ago, my 22 year old son-in-law, a self-described "slacker", sent me the photo above in an email. "That's you on the left - Used to be a Corporate Hosthot. But here's a job for you NOW - Horn Playing Homeless Beggar. You might have to dumb yourself down, but I like you a lot better without the fancy suit! Now you're a slacker like me! Not so dignified now but a lot more fun to be around!" I must admit that I didn't see the humor at all. I was already humiliated and now I was having my face rubbed in it. The impeccably dressed gentleman on the left looks very much like I once did, my former self. The man on the right - well - hopefully I don't yet look like that! Not so dignified! Why did he have to say it? I was angry. Then, with my wife's help, I realized that I had lost all perspective. I was finally able to laugh at my own situation and stop taking myself quite so seriously. The addition of humor has allowed me to see my situation more clearly. Hope has returned. 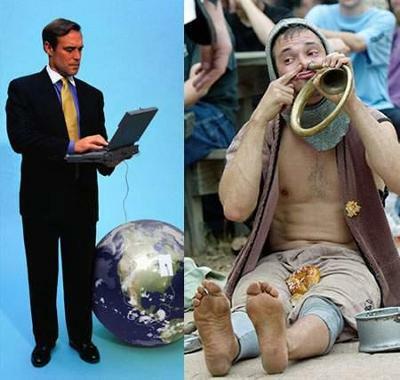 When I asked my son-in-law why he had chosen THAT photo on the right, he said "I picked a job where you're barefoot." "You always used to be so dapper and sharp in your old life. I had my eye on those expensive shoes you wear, but I can't afford them." "So if you stay barefoot, I get all your shoes, and your socks and tie and those great pinstriped suits. Hey, I won't be a slacker all my life!" Join in and write your own page! It's easy to do. How? Simply click here to return to Your Best Positive Attitude Tips.